AUTHENTIC 78 Card, REGULAR size + Instructions Rider-Waite tarot card deck ~ by Waite, A.E. ~ Dimensions - 2 3/4" x 4 3/4"
NOTE: Unfortunately over the past few months, the eBay marketplace has become flooded with CHEAP knockoffs of the Rider Waite Tarot Decks. 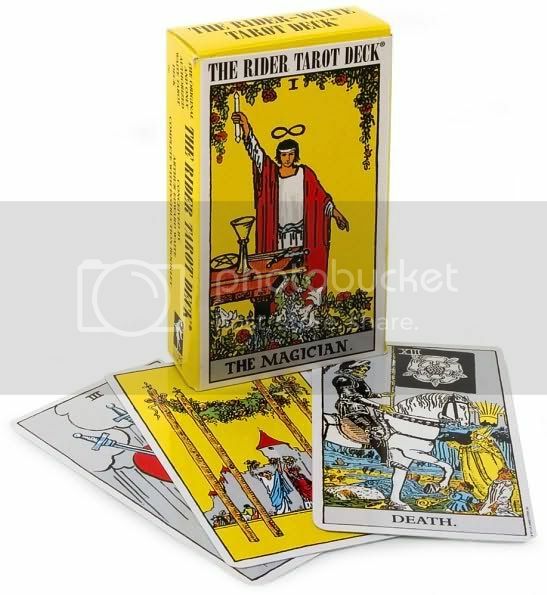 These sellers were originally calling them "Rider Waite Tarot" in their listings and were subsequently removed by eBay for trademark infringement of the name. However they have recently began popping back up again. The manufacturer is currently looking into legal action to have them removed. Filled with rich amounts of symbolic imagery that will help you find the answers you seek, the Rider-Waite Tarot is the world`s most popular tarot deck. Mr Waite, though born in America, spent most of his life in England. He was a scholar of occultism, and became known for taking a logical, systematic approach to spiritual and occult studies. This symbolic Tarot deck captured much of the abstract realm of Tarot reading and made it easily understood for the average person. The cards were originally published in December 1909 by William Rider And Son of London. The deck was the product of a collaborative effort between artist, Pamela Colman Smith (born 1878 died 1951) and Dr Arthur Edward Waite (born 1857 died 1942.) Both Smith and Waite were members of the Order Of The Golden Dawn, a famous occult group of the 19th Century. For some reason (sexism no doubt), Pamela Smiths' contribution is usually ignored, and the deck is commonly called the Rider-Waite Tarot. The symbols used were influenced by the 19th century magician and occultist Eliphas Levi. During WWII, the original printing plates for this deck were destroyed in a bomb raid. At some point in the early part of the last century Random House purchased the rights to reproduce the deck in the USA and they subcontracted those rights to US Games. Included in the box is an excellent instruction booklet taken directly from A.E. Waite's The Key To The Tarot, which includes the most famous spread, the Celtic Cross.